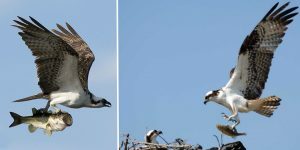 For the first time in 100 years Osprey hawk returns to Wales – Home for Nesting | News by Wales Express News, People Before Profit! For the first time in 100 years Ospreys have set up home in Denbighshire and are nesting at Welsh Water’s Llyn Brenig reservoir near Cerrigydrudion. Photo taken from the nest camera of the Osprey at Llyn Brenig – Llyn Brenig reservoir near Cerrigydrudion. 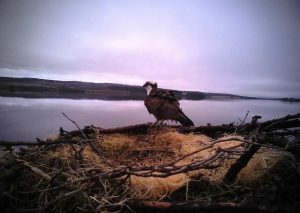 The team at Llyn Brenig have been behind a five year project to encourage Ospreys to breed at one of the five manmade nests at Llyn Brenig and are very excited that their hard work has now resulted in a breeding pair. They are hoping for two to three chicks over the next few weeks. Ospreys are a protected species and tend to mate for life. It is the first time this pair has bred together and is believed to be a Scottish male ringed HR7 and a female that was born at Rutland Water known as Blue 24. The nest site is being monitored round the clock by volunteers and there are also two camera’s at the nest site. While there is no formal exclusion zone at the present time, visitors are being asked not to go within 150 metres of the nest. It must be pointed out that any unauthorised person trying to get too close to the nest could face large penalties. Osprey hawk – We are all delighted that this pair have chosen Llyn Brenig to nest. Llyn Brenig is one of Dŵr Cymru Welsh Water’s four visitor centres across Wales. It has over 2,500 acres of forest, moorlands and lake amid stunning upland scenery. The reservoir has an outstanding upland fly fishery and permits are available from the onsite fishing shop along with boat hire if required. You can also hire bikes from the visitor centre or just enjoy one of the many walks which are available to all abilities. The café offers a wide range of homemade, locally sourced food and with panoramic views of the reservoir, which is one of the largest areas of inland water in Wales you are sure to feel relaxed while you enjoy your meal. Along with the adventure playground, and picnic areas Llyn Brenig and its visitor centre is a jewel in the area not to be missed.